I'm sure you've heard the phrase, "It takes a village...". Indeed it does take a village here at CASA of Central Virginia. Our staff is small but our village is extensive! We have about 100 CASA volunteer advocates, 21 board members, immeasurable special event volunteers, office volunteers, interns, corporate partners, and donors who make our mission possible. Each one contributes in his or her own unique way to wrap support around the children who are appointed to us by the courts. Together, we are a powerful voice for children. 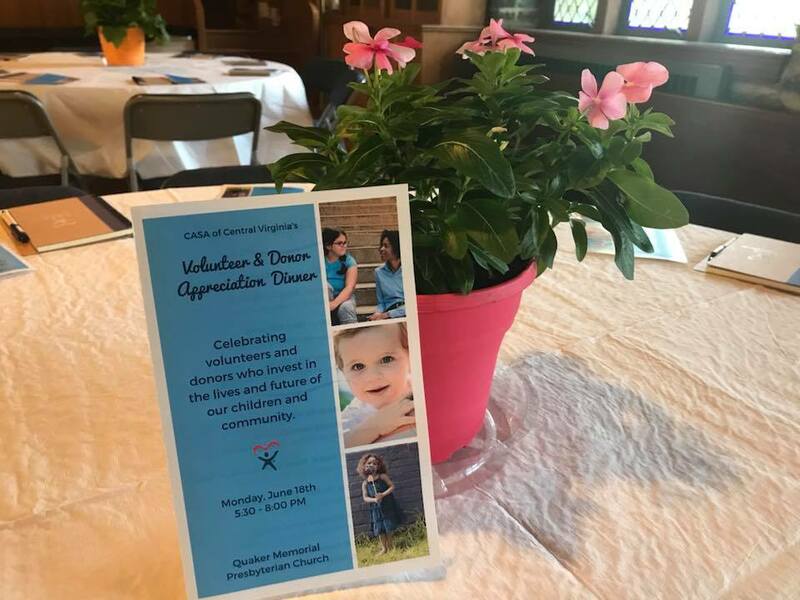 On Monday evening, June 18, our village came together at Quaker Memorial Presbyterian Church to celebrate everyone who makes CASA possible. We want to thank Pacific Life and The Greater Lynchburg Community Foundation for their financial support of our Volunteer and Donor Recognition Dinner. During the evening, we presented awards to volunteers and donors who had made a difference over the past year. This award was established to honor an individual donor who has made a significant impact on our organization with their gift(s).